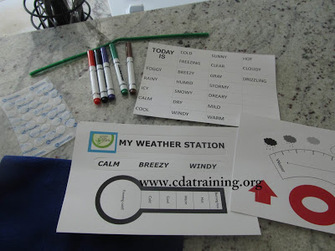 * Lesson plan objectives and assessments can be adapted to use this activity with preschoolers. o 1. Measure the length of an object by selecting and using appropriate tools such as rulers, yardsticks, meter sticks, and measuring tapes. 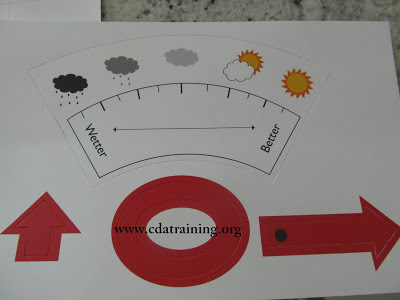 Prepare for the activity by creating the rain gauge with your students. Cut the top off of the plastic bottle. Have students measure and create the line around the bottle in regular intervals using measuring tools and a permanent marker. Flip the top of the bottle and place it back inside the rain gauge to act as a funnel. As it rains, encourage students to practice their math skills by estimating what the level will be at that day, measuring, and counting. Students can keep a log of the change in water over a week. 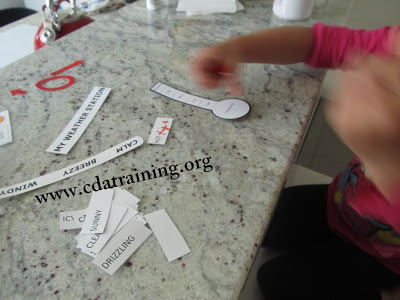 **This lesson is designed for students who already have some measuring skills. It is not intended to be an introductory lesson, and should be used as hands-on practice. Observe and record the student’s ability to measure using standard units (inches or centimeters). Take notes on their counting skills and ability to estimate as well. If needed, you can go back and review these skills with them at a later time. Make the following: A thermometer with the words, freezing cold, cold, cool, warm, hot, and burning hot. My weather station. Today is. 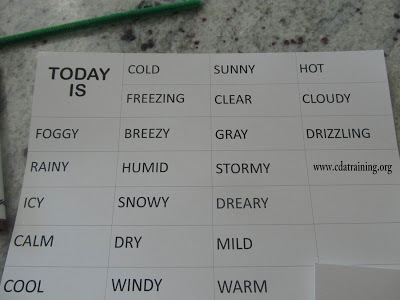 Sunny, cloudy, icy, snowy, rainy, stormy, windy. Using the Velcro peel off and attach them to the backs of all of the above. 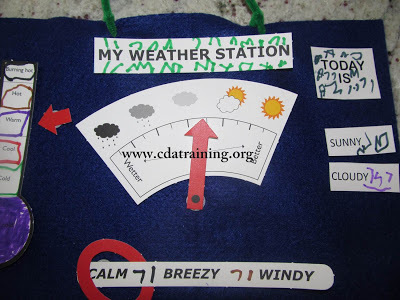 Cut 2 slits in the top of the felt and attach the pipe cleaner so your child can carry their weather station. 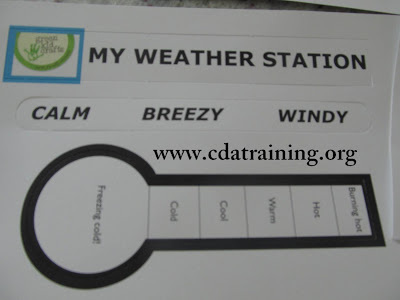 Let your child change their weather station everyday.